First thing I will say is a friend of mine recently gave me a tip which was very useful when making cakes. To cut your sponge cakes instead of using a knife and making lots of crumbs just use a piece of sewing cotton and pull through the center. I just thought that was brilliant and wanted to pass it on. 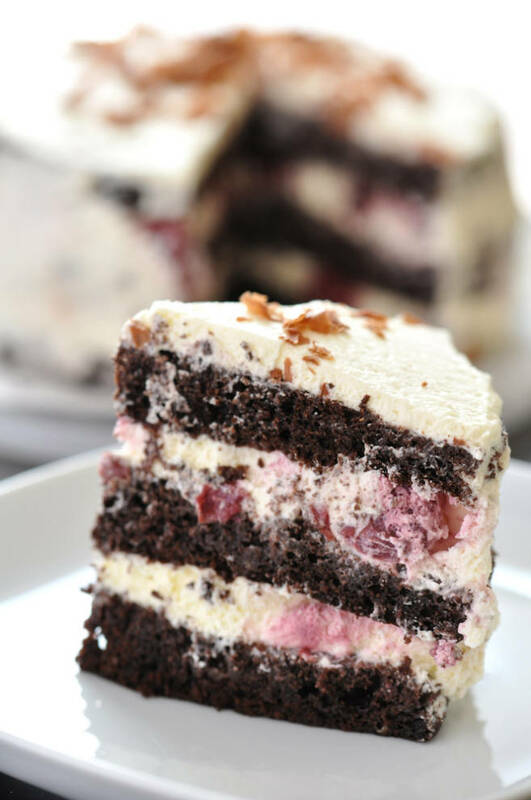 As for this recipe which is from Linda Greer I think it will be the best Black Forest cake you have ever made. For a cake that ends up looking so beautiful the recipe is not that complicated. You can use the chocolate cake part in all sorts of other recipes too! Preheat oven to 350 F. Grease and flour two 9 inch round cake tins & cover bottoms with greaseproof paper. In a large bowl combine flour, 2 cups sugar, cocoa, baking powder, bicarb soda and salt. Add eggs, milk, oil and 1 tablespoon vanilla; beat until well blended. Pour batter into prepared pans. Bake for 35 minutes, or until wooden toothpick inserted in centres comes out clean. Cool tins on wire racks for 10 minutes. Loosen edges and remove cakes to racks to cool completely. Drain cherries, reserving 1/2 cup juice. Combine reserved juice, cherries, 1 cup sugar and cornflour in a 1/2 gallon saucepan. Cook over low heat until thickened, stirring constantly. Stir in 1 teaspoon vanilla. Cool before using. Combine whipping cream and icing sugar in a chilled medium bowl. Beat with an electric mixer at high speed until stiff peaks form. With long serrated knife, split each cake layer horizontally in half. Tear one split layer into crumbs; set aside. Reserve 1 1/2 cups icing for decorating cake; set aside. Gently brush loose crumbs off top and side of each cake layer with pasty brush or hands. To assemble, place one cake layer on cake plate. Spread with 1 cup icing; top with 3/4 cup cherry topping. Top with second cake layer; repeat layers of icing and cherry topping. Top with third cake layer. Ice side of cake. Pat reserved crumbs onto icing on side of cake. Spoon reserved icing into pastry bag fitted with star decorator tip. Pipe around top and bottom edges of cake. Spoon remaining cherry topping onto top of cake.